Schaumburg Divorce Attorney | Hoffman Estates Family Law Lawyer | IL | Anderson and Associates, P.C. For more than 30 years, the divorce and family law lawyers of Anderson and Associates, P.C. have advised, represented, and advocated for clients in Schaumburg, Hoffman Estates, Palatine, Barrington, Arlington Heights, and throughout the northwest suburbs of Chicago. Our attorneys are highly skilled in all aspects of family law. We can help you understand your rights and options and represent you during your divorce, whether you are looking to allocate parental responsibility, determine child support, establish paternity, or resolve disputes related to the division of marital property. With an experienced, compassionate family law attorney on your side, you will be able to survive the divorce process and move on to a new phase of your life. We help you understand your rights in all aspects of divorce, including the equitable division of property, spousal support/maintenance, and prenuptial agreements or postmarital agreements. We protect children's best interests in matters of child custody, child support, parenting time (visitation), adoption, and guardianship. We help couples survive the divorce process with minimum conflict through mediation and collaborative law services. If you are in a situation involving domestic violence, we can help you obtain an order of protection. Whether you are considering divorce or are already involved in the divorce process, we can help you understand your rights and options. We can advise you on any family law matter, including child custody, parenting time, adoption, guardianship, and grandparents' rights. The new Illinois child support law, which went into effect in July 2017, has changed how child support payments are calculated. In addition to divorce and family law services, the attorneys at Anderson and Associates, P.C. can assist you with a wide range of other legal services. We provide estate planning services, including estate administration, wills, trusts, and probate matters. If you are facing a difficult financial situation, we can help you understand your options for Chapter 7 or Chapter 13 bankruptcy, avoid foreclosures, and negotiate with creditors. If you are facing a criminal law charge, we can analyze your case and help you determine your options for defense. No matter your situation, our experienced and knowledgeable attorneys will work with you to help you understand your legal options. Contact us at 847-995-9999 for a free initial consultation. As the owner and founder of Anderson and Associates, P.C., Jonathan Anderson has guided the growth of the law firm for over 30 years, working to achieve optimum results for his clients in divorce and family law cases. He concentrates on divorce cases involving complex asset valuations and hidden assets, litigation to challenge or enforce premarital and postmarital agreements, and issues related to child custody. Jonathan Anderson leads a team of dedicated, experienced attorneys that provide guidance in any issues related to divorce, family law, estate planning, and bankruptcy. In the event of your death, it is important to have the legal framework in place to provide for your family. Our estate planning attorneys can assist in the creation of wills and trusts and provide knowledgeable representation in probate matters and contested estates. If you are struggling with overwhelming debts, Chapter 7 or Chapter 13 bankruptcy may be your best solution. Our experienced attorneys can walk you through the bankruptcy process, help you avoid foreclosure, and negotiate with creditors on your behalf. 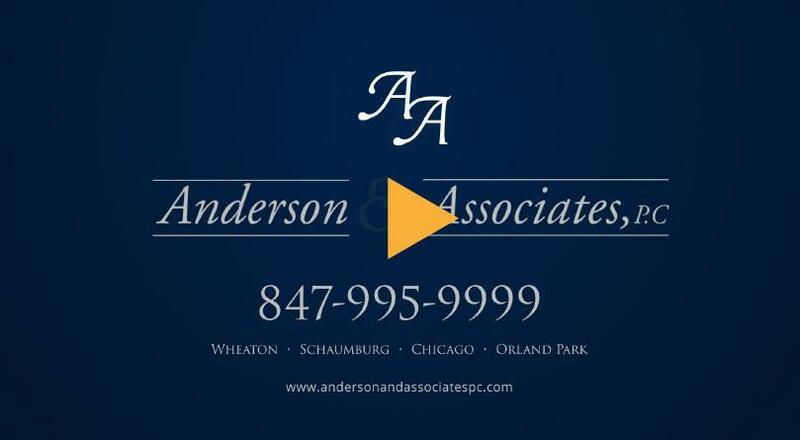 If you are in need of legal services for any matters related to family law, adoption, estate planning, or bankruptcy in Schaumburg and the surrounding areas, please contact the law offices of Anderson and Associates, P.C. to schedule a free initial consultation. Call our law firm at 847-995-9999, and we will work with you to help you understand your rights and make sure that you have a knowledgeable, experienced, compassionate attorney on your side.